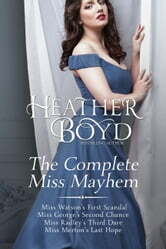 Introducing The Complete Miss Mayhem - Four friends match wits with their neighbors in this humorous historical romance boxed set. 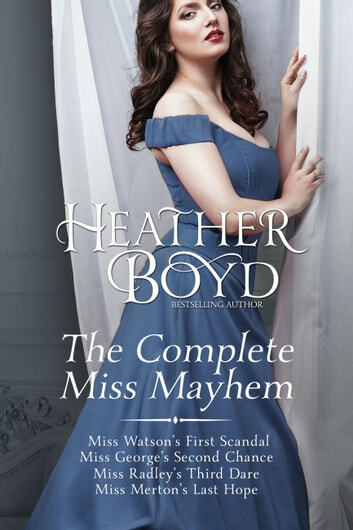 Miss Watson's First Scandal: Overworked London banker David Hawke had two goals for his week in the seaside town of Brighton: one, recover a debt from a friend and two, relax for his remaining holiday. Marriage wasn’t part of the plan…until the girl next door barges in and turns his life upside down. Miss George's Second Chance: Peter Watson had accepted that a loveless marriage was the only means to solve his financial problems until an unexpected inheritance changes everything. When Imogen releases him so he might marry for love instead, he discovers the carefree life of a peer lacks… the girl he never dared kiss. Miss Radley's Third Dare: The only person who understood what Julia Radley wanted most in life was the man who accepted her challenge to a bold swimming race, and lost. But when he suggests they marry to quiet the resulting scandal, she discovers the consequences of her actions are far reaching for him too. Miss Merton's Last Hope: Never-to-wed Melanie Merton had a knack for repelling suitors, that is until neighbor Walter George got close enough to learn her shocking secret. Although Melanie assures him there's no hope, Walter can't convince himself to give up on the promise of love.